Justice League Unlimited really pulled out all the stops when it came to obscure characters. By most accounts, anytime they had a big crowd shot of heroes, they’d populate it by letting various crew members pick their favorite characters. The end result was a rather eclectic selection of heroes, giving a brief spotlight to some of DC’s lowest tier characters. And, thanks to Mattel’s corresponding line of tie-in figures, a lot of them lucked into their very first action figures. One of those lucky guys was Waverider, whose big claim to fame is being the catalyst for DC’s “Armageddon 2001,” an event that was supposed to turn Captain Atom into one of the DCU’s big bads, but ended up going with Hawk instead. To date, Waverider’s JLU figure is the only figure he’s received, but that’s not bad for a character that hasn’t been relevant since 1991. 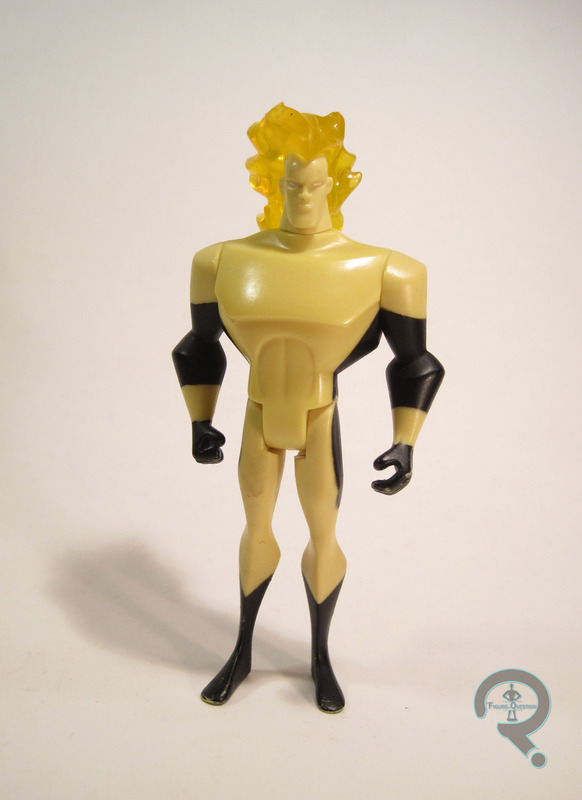 Waverider was released in the second series of Justice League Unlimited three-packs from Mattel. He was packed with Flash and Hawkgirl, who were both re-releases of their single-release Justice League figures. He also got a single release of his own later on in the line. The figure stands just shy of 5 inches tall and has 4 points of articulation. Technically, there’s a joint at the neck, but the way the hair is attached renders the joint motionless. 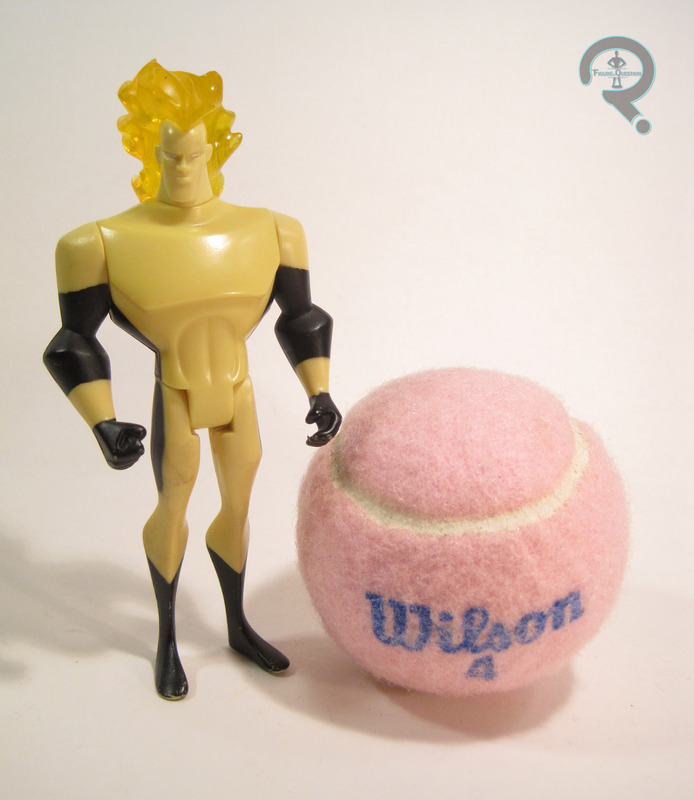 Waverider uses the mid-sized male body (used on figures such as Starman), with a unique head. The head and hair are two separate pieces (allowing the flames of the hair to be molded in translucent plastic). The head is fairly generic; he’s just a fairly average-looking bald guy, but he looks about like he should. The hair is suitably energetic, and adds a nice bit of flair to him, though it always feels like it’s about to break off. Paint always did the heavy lifting on the JLU line, and Waverider’s not an exception. He’s honestly a bit drab. In the comics, Waverider was always black and a yellow-ish gold, but here the gold has been swapped out for a washed-out yellow, that just doesn’t really pop. The first series of JLU figures was rather difficult to find, so when I found the entire second series of them (Waverider included) while on vacation, my parents very kindly bought them for me (because they’re awesome like that). At the time, I didn’t know the character at all, so it was fun getting to figure out who he was after the fact. He’s not the most exciting figure of all time, but I have fond memories of getting him and his series mates.